, where it becomes infinite) it defines a vector field. From the above formula it can be seen that the electric field due to a point charge is everywhere directed away from the charge if it is positive, and toward the charge if it is negative, and its magnitude decreases with the inverse square of the distance from the charge.
. It diverges and becomes infinite at the locations of the charges themselves, and so is not defined there. Electric fields are caused by electric charges, described by Gauss's law, or varying magnetic fields, described by Faraday's law of induction. Together, these laws are enough to define the behavior of the electric field as a function of charge repartition[clarification needed] and magnetic field. However, since the magnetic field is described as a function of electric field, the equations of both fields are coupled and together form Maxwell's equations that describe both fields as a function of charges and currents. , permittivity, when charges are in non-empty media. , where the Dirac delta function (in three dimensions) is used. Conversely, a charge distribution can be approximated by many small point charges. ; for instance, Coulomb's law is linear in charge density as well. 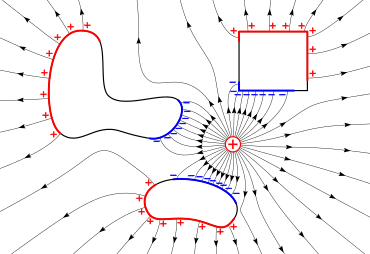 Experiment illustrating electric field lines. An electrode connected to an electrostatic induction machine is placed in an oil-filled container. Considering that oil is a dielectric medium, when there is current through the electrode, the particles arrange themselves so as to show the force lines of the electric field.
. This is analogous to the gravitational potential. This suggests similarities between the electric field E and the gravitational field g, or their associated potentials. Mass is sometimes called "gravitational charge". where ΔV is the potential difference between the plates and d is the distance separating the plates. The negative sign arises as positive charges repel, so a positive charge will experience a force away from the positively charged plate, in the opposite direction to that in which the voltage increases. In micro- and nano-applications, for instance in relation to semiconductors, a typical magnitude of an electric field is in the order of 7006100000000000000♠106 V⋅m−1, achieved by applying a voltage of the order of 1 volt between conductors spaced 1 µm apart. 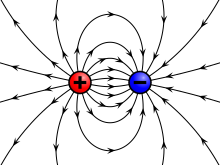 its magnetic permeability, and E and B are the electric and magnetic field vectors. ^ Purcell, Edward M.; Morin, David J. (2013). Electricity and Magnetism, (3rd ed.). New York: Cambridge University Press. pp. 14–20. ISBN 978-1-107-01402-2. ^ Browne, p 225: "... around every charge there is an aura that fills all space. This aura is the electric field due to the charge. 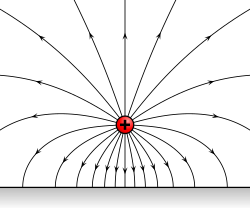 The electric field is a vector field... and has a magnitude and direction." ^ Roche, John (2016). "Introducing electric fields". Physics Education. 51: 1. ^ Richard Feynman (1970). The Feynman Lectures on Physics Vol II. Addison Wesley Longman. pp. 1–3, 1–4. ISBN 978-0-201-02115-8. ^ Purcell, Edward M.; Morin, David J. (2013). Electricity and Magnetism, (3rd ed.). New York: Cambridge University Press. pp. 15–16. ISBN 978-1-107-01402-2. ^ a b c Serway, Raymond A.; Vuille, Chris (2014). College Physics, 10th Ed. Cengage Learning. pp. 532–533. ISBN 1305142829. ^ Purcell, Edward (2011). Electricity and Magnetism, 2nd Ed. Cambridge University Press. pp. 8–9. ISBN 1139503553. ^ Purcell, p 25: "Gauss's Law: the flux of the electric field E through any closed surface... equals 1/e times the total charge enclosed by the surface." ^ Purcell, p 356: "Faraday's Law of Induction." ^ Purcell, p7: "... the interaction between electric charges at rest is described by Coulomb's Law: two stationary electric charges repel or attract each other with a force proportional to the product of the magnitude of the charges and inversely proportional to the square of the distance between them. ^ gwrowe (8 October 2011). 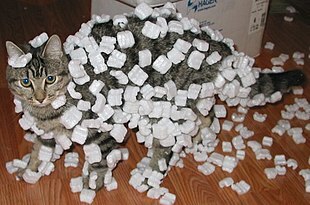 "Curl & Potential in Electrostatics". physicspages.com. Retrieved 21 January 2017. ^ Salam, Abdus (16 December 1976). "Quarks and leptons come out to play". New Scientist. 72: 652. ^ Huray, Paul G. (2009). Maxwell's Equations. Wiley-IEEE. p. 205. ISBN 0-470-54276-4.